modifications to this equipment would void the user's authority to operate this device. in conformity with EN ISO 7779.
the power cord, plug, and AC adaptor. electric shock, current leakage, or fire. a heater or open flame. which could result in fire or electric shock. and contact your dealer for service. fuse cover, the plug must not be used. replace the fuse and fuse cover. The glass in the scanning area becomes very hot. Shows the scanner’s status. For details, see "About LED" (page 13). 1. Press the power switch (A) of the scanner to ON. The LED (Green) will blink for about 30 seconds, and then it will become steady. or placing documents on the feed tray. To accomplish this, follow the steps below. 1. Click [Start], and then click [Control Panel]. • In Windows 2000, click [Start], and then click [Setting] - [Control Panel]. right clicking on the scanner icon. and then display the scanner property dialog box by clicking [Properties] button. 3. Click the "Events" tab. 4. Select an event in the "Scanner events" list. The selected event activates a scanner application. The following events can be selected. An event occurs when placing documents on the feed tray. An event occurs when pressing the Start / Stop button of the scanner. If the scanner goes into sleep mode, you must press the Start / Stop button twice. that application will be launched automatically. than 7.5 mm (0.3 in.). guaranteed feeding length is 70 mm (2.8 in.). exceeding the legal size length. Embossed card is also acceptable. must not get entangled with others. down, and then try again. Use the mixed batch card guide (page 25) when scanning mixed media (cards and papers) at the same time. – Reduce the number of sheets of paper loaded on the feed tray. 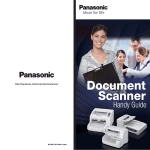 – Change the scanning resolution. This scanner is equipped with an ultrasonic sensor to detect double feeding. The width of documents that can be detected is A5 or larger (148 mm (5.8 in.)). Fan the stack of documents to separate all the edges. Hold both ends and bend the documents as shown in the illustration. To flatten the documents, hold firmly and pull them apart as shown in the illustration. 2. Adjust the document guides (A) slightly larger than the actual size of the documents. • The documents feed better when the leading edges are aligned slantwise as shown in the illustration. 4. Place the documents on the feed tray with the side to be scanned facing down. • Set the leading edge of documents as shown in the illustration (A). Place the documents as shown in the illustration. The height of all the documents on the tray should be less than 7.5 mm (0.3 in.). Exceeding this height might cause paper jams or skewing. 5. Adjust the document guides (A) to the size of the documents to be scanned. 6. Open your scanning application*1 and scan the documents. User Utility application. Remove the jammed sheet according to the following instructions. The scanning glass area may be very hot. When the scanning glass is hot, don't touch the area around it. Wait until the scanning glass cools down before removing paper. 1. Remove all documents from the feed tray. 2. Press the door open button (A), and open the ADF door (B). 3. Remove the jammed document. • If the document is jammed in the feed tray area, pull it backwards as shown in the illustration. If the document is jammed in the exit area, pull it forward as shown in the illustration. 4. Close the ADF door. • Push both sides of the ADF door down slowly until it clicks into place. card guide prevents a card from skewing when scanning paper documents and a card simultaneously. Install the mixed batch card guide as shown in the following illustration. Set paper documents on the feed tray, and a card on the mixed batch card guide respectively. • The card set on the mixed batch card guide is fed after completing the paper document scanning. • The mixed batch card guide is suitable for the following card. Embossed card is also available. When using the mixed batch card guide, the document guides cannot be adjusted to less than A5 size. Set only one card at a time. equivalent to about 20 sheets at 80 g/m² or 20 lb. Use the control sheet that is the same size as the document you are scanning. 3. Select [Control Sheet] from the "Manuals" list on the right side of the screen. 1. Turn OFF the scanner power. Clean the scanner at least once a week or when 2,000 sheets have been scanned, whichever comes first. Clean the scanning glass area and reference area when black or white lines appear on the scanned images. Open the roller cleaning paper on the dotted line (A), and take out the roller cleaning paper. Only use the roller cleaning paper to clean the rollers and scanning glass. is purchased, or you can call our Supplies and Accessories department at 1-800-726-2797 (U.S.A. The scanning glasses area may be very hot. When the scanning glass is hot, work after waiting to get cold without touching around it. 3. Open the paper feed roller cover (green) (A). 4. Use the roller cleaning paper (KV-SS03) to remove the dirt from the surface of all rollers. 5. Close the paper feed roller cover (green) firmly. • Make sure to close both sides of the paper feed roller cover (green) until they click into place. 6. Use the roller cleaning paper to clean the surface of the double feed prevention roller. 7. Use the roller cleaning paper to clean the surface of the conveyor rollers (A) and exit rollers (B). 8. Use the roller cleaning paper to clean the surface of the free rollers (A). 9. Close the ADF door. 10. Reset the roller cleaning counter in User Utility to 0. • Turn ON the scanner power. 3. Clean the scanning glass area (A) and reference area (B) using the roller cleaning paper. 4. Remove dust on the double feed detectors (A) with a cotton swab. 5. Close the ADF door. To purchase replacement parts, please contact your dealer. exchange kit (KV-SS035)", and replace each roller periodically. The usable life of each roller is as follows. The scanner counter can be confirmed by using the User Utility. 3. Open the double feed prevention roller cover (green) (A). 4. Remove the double feed prevention roller (A). 5. Take out the new double feed prevention roller in the optional "Roller exchange kit (KV-SS035)". 7. Close the double feed prevention roller cover (green) (A) firmly. Be sure to close the double feed prevention roller cover until it clicks into place. 8. Open the paper feed roller cover (green) (A). 9. Remove the paper feed roller (A). 10. Take out the new paper feed roller in the optional "Roller exchange kit (KV-SS035)". 11. Install the new paper feed roller with the gear on the left side. 12. Close the paper feed roller cover (green) firmly. Make sure to close both sides of the paper feed roller cover (green) until they click into place. 13. Close the ADF door. 14. Reset the roller replacing counter in User Utility to 0. Problem with the AC adaptor. outlet, and call for service. hub is not functioning well. Do not connect via the USB hub. certified Hi-speed USB 2.0 cable. load it again (page 19). height, because of curling or folding. The scanning glass is dirty. Department at 1-800-726-2797 for further assistance (U.S.A. only). 2. Unplug the power cord from the outlet, and remove the AC adaptor and USB cable from the scanner. 3. Remove the feed tray from the scanner. 4. Put the mixed batch card guide into the accessory box. or every 2,000 sheets scanned. the image, and paper type. The scanning speed was measured using a proprietary method. Although you can spicy other paper sizes, scanning quality cannot be guaranteed. (20 lb.)]. It may vary depending on the kinds of paper, usage and cleaning intervals.